Cone mountings provide a flexible, high load capacity, yet fail-safe method of anti-vibration mounting suited to compression and shear loadings. 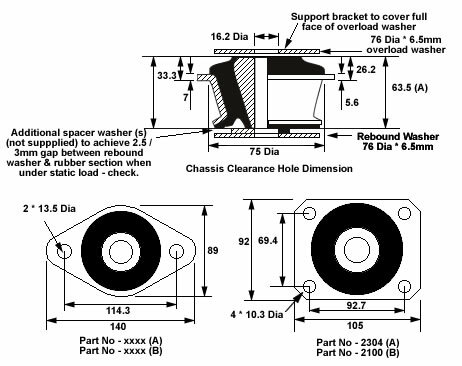 (utilising overload and rebound washers). The use of these washers prevents excessive movement of the mounted equipment under vehicle stop/start, torque reaction, and braking forces as well as marine seaway motion and shock disturbance. Applications include mobile generator sets, vehicle cab mountings, vehicle body suspensions, off road vehicle applications, prime power units, marine engines, gearboxes and radiators. We offer two standard types, Iss 1 and Iss 3 - 1.99 as detailed below.